I’m off to SU convention – and I’m swapping! Well I’m on the coundown now. I have a workshop in Stanthorpe tomorrow and then I can give my undivided attention to packing for the annual Stampin’Up! Convention. This year it’s being held in Canberra. I simply cannot wait! I don’t know which part I love the most. Catching up with those demonstrators that I only ever see at Convention. i.e. my upline Angela Sargeant from Sydney, The gorjuss Claire Daly who lives in Melbourne (Claire and I have a ‘tradition’ that we have our pic taken together), Maggie Mathern from Geelong, oh and the list just goes on and on and on and on and on……………. My amazingly patient husband is driving me to Canberra (and amusing himself during each long day) and I’m taking along with me two of the Bent Ink linations. Therese (Miss T) Azzopardi from Tamworth and Marion (Maz) Benfield from Inverell. On the way we will collect Tracey Eaton at Narellan. Poor Dennis his ears will be ringing by the time we reach Canberra. In Canberra we will meet up with three more Bent Inks. Sue Haynes from Casino, Shirley Kelly from Grafton and Keira Hector from Stroud. Oh how excitement! This year, I’ve decided to participate in the swaps. I didn’t bother last year as I just had too much happening in my life at the time. This year I got a bit organised (thanks to my friend Lolly) and designed and finished them early. So I decided to give you all a preview and post a pic here now. L to R. Wee note book that I have made by covering some cardboard to make a front and back, bound it with my Bind-it-all. 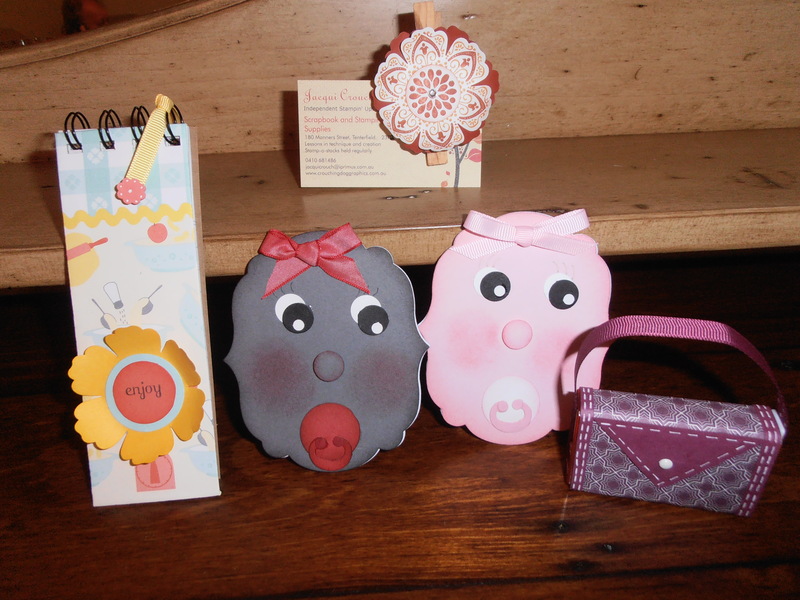 Two ‘baby’ note books. Made with the new Framelits die. Sooooooo stinkin’ cute! Tic-tac handbag. Does a girl need an excuse for a new handbag? Not this one! This is a covered plastic pack of tic-tacs. Looking suspiciously like a handbag! On the top row is a wooden peg fridge magnet. So there! These are my swaps for 2012 SU Convention. I hope they inspire other demonstrators to think outside the square when using products. SU products aren’t just for cardmaking or scrapbooking. You can use our products for all manner of crafty things. If I can master updating my blog my phone I will do so from the Convention, but I am a bit of a computer/phone moron so I may not be able to do that. Hi Jacqui, It was great meeting you and swapping with you at Convention. I loved your ‘baby’ swap – so cute!